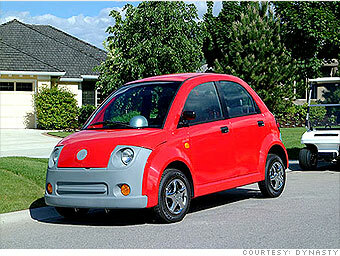 Dynasty Electric Car Corp. is a company in transition. The Canadian electric car maker was recently bought by a Pakistani auto company, and its North American manufacturing facilities are being transferred to Pakistan, a company representative said. Right now, Dynasty has only a few cars available in the U.S., but more should be available once factory production is up and running again. The Dynasty iT sedan has a two-speed transmission and halogen headlamps. It has an aluminum frame and a fiberglass body, and it can go up to 25 mph.